Sunshine is our favorite color. Shop featured hotel deals to complete your package. Hotel offer blackout dates: 8/18/19 – 11/1/19. Hotel offer is valid in Deluxe Ocean View, Deluxe Pool Ocean View, Luxury Royal Level Ocean View, or Luxury Royal Level Pool Ocean View. Hotel offer blackout dates: 4/10/19 – 4/30/19. Two children, ages 17 and under, stay free when staying with two paying adults in the same room. A VIP Value Card is included in your stay and offers discounts on hotel restaurants, bars, casino, and gift shops. Hotel offer blackout dates: 4/7/19 – 4/8/19, 4/30/19, 5/1/19, 5/31/19, 6/1/19, 7/11/19 – 7/13/19, 9/6/19 – 9/7/19, and 11/1/19. *Up to $150 per reservation promotion code savings apply on flight + hotel vacation packages of $1,500 or more to the Caribbean. Save $100 on packages totaling $1,500 – $2,999; Save $150 on packages totaling $3,000 or more. Savings is reflected in the package price when using promotion code CARIB150 at the time of booking and is based on total package price before discount is applied. Length of stay for flight and hotel components must match. Promotion code intended for redemption by individual consumer only. One-day advance purchase is required. Savings valid if booked 4/9/19 – 4/22/19 by 6:00 p.m. CT for travel 4/10/19 – 11/1/19. 1Resort coupons are issued per room, per stay. Resort coupons are issued for limited discounts on select amenities including spa treatments, a romantic dining experience, and wine purchases. Resort coupons cannot be applied toward beauty salon services, spa product purchases, telephone charges, dolphin experiences, gift shop purchases, boutique purchases, internet service (where applicable), marina services, dive shop, medical services, car rentals, or travel agency services. Resort coupon offer requires a three-night minimum stay. 2Children, ages 12 and under, stay free year-round when staying with two paying adults in the same room. 3Get $600 in resort coupons in Diamond Club room categories or $300 in non-Diamond Club room categories. Use your resort coupons towards room upgrades at the time of check-in, wine purchases, and the Royal Spa. Additional details will be provided upon hotel check-in. Resort coupons cannot be exchanged for cash. There is no cash reimbursement if unused. Resort coupons promotion is not combinable with other coupons or credits; discounts; or promotions unless specifically indicated. Resort coupons are not transferable, non-cumulative, and cannot be held over for future stays. Promotion, prices, and applicable services are subject to change without prior notice. 4Instant savings value at these resorts varies depending on length of stay. Riu Bambu: Stay three or four nights and get $100 in instant savings. Stay five or six nights and get $150 in instant savings. Stay seven nights or more and get $200 in instant savings. 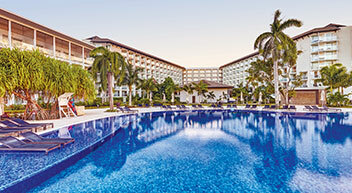 Riu Palace Paradise Island: Stay three or four nights and get $150 in instant savings. Stay five or six nights and get $225 in instant savings. Stay seven nights or more and get $300 in instant savings. Three-night minimum stay required. 6Up to two children, ages 12 and under, stay free when staying with two paying adults in the same room. 7The amount of up to $500 in resort discounts equals to the discounts given to the guest that can only be applied on the purchase of limited services and products within the resort with the maximum already stated. 8Room upgrade is from Rainforest View King to Pool View King or Rainforest View 2 Queen to Pool View 2 Queen room categories and will be assigned at time of check-in.